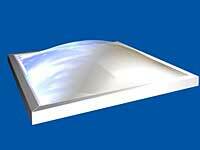 DryLight from Carlisle is a skylight with fully encapsulated glazing designed to provide enhanced energy savings. Because of DryLight’s superior performance features, Carlisle is offering the only total-system warranty in the industry that will cover any incident of leakage in the skylight, the curb and the installation for up to 20 years. The encapsulation technology provides the skylight with a bond between the frame and the dome, reducing the leakage typically associated with traditional skylights. The thermoplastic retainer frame is also non-conductive, and provides thermal efficiency. DryLight is available in curb and curb-mountable designs that can incorporate Carlisle membrane flashing.